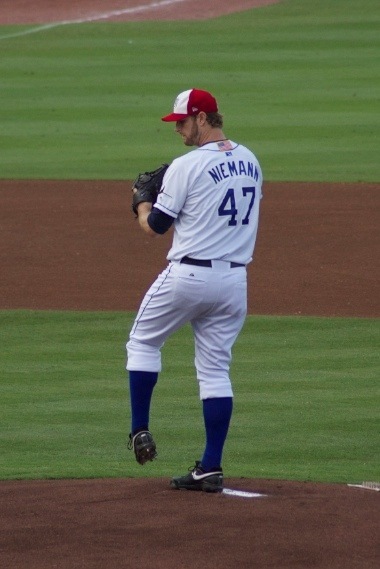 Jeff Niemann is a large (as in 6'9", 255 lb) right-handed pitcher who pitched for the Durham Bulls all of 2007 (131 innings, 3.98 ERA) and 2008 (133 innings, 3.59 ERA) before going up to the Rays in 2009 (541 ML innings, 4.11 ERA, so far). He was in a Bulls uniform just last year for a brief two-game rehab assignment. Earlier this season he had a leg broken by a line drive and he is now working his way through the system on his way back to the Rays. Since this is such a long home stand we might get to see him twice before the Bulls leave town. As noted the other day, there’s been some speculation that the Rays could save themselves some roster-juggling problems by leaving him with the Bulls until September 1. That might give him a third start with the Bulls. Expect him to be on a low pitch count. Nevertheless, it will be fun to see him again.